3 - 4,5,5..........Bingo von Ellendonk. 3 - 4................Cona von Niederkassel. 4 - 5,6,6..........Palma von Ellendonk. 4 - 5,6,6..........Jago von Beelen. 4,5 - 5,6..........Satan von Ellendonk. 4,5 - 5,6..........Blanka von der Au. 4 - 5................Guys Hilo vom Norden Stamm. 5 - 5................Biene von Niederkassel. Allee vom Blitzkrieger was a substantial female with full dentition and DNA tested as a vWD Carrier (VetGen). She rated pronounced in bitework in her Schutzhund I trial while her litter-sister, Aisin vom Blitzkrieger, was always pronounced in her bitework and V rated in all her Schutzhund tracking scores. Aisin also is one of only three FH2 Dobermann females in North America and foundation female for the Tanzenhaus Kennel in U.S.A. (dam of the vom Tanzenhaus “A, B” litters). Allee's sire, Gero von der Mooreiche, passed the Körung 'for life' with highest rating for hardness and working drives and was twice runner-up at the D.V. Meisterschaft in 1992 and 1996. Her dam, Chauka von Warringhof, passed the ZTP with highest possible rating for protection, courage, fighting drive, self-assuredness and high hardness under German judge Ottmar Vogel. Allee lived to 10¾ years of age, her sire to 12 years of age, her dam to 8 years of age and litter-brother, Axel vom Blitzkrieger, to 10 years of age. 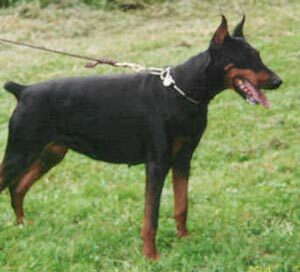 Dax: sire of the vom Blitzkrieger “G, J, N” litters (Gorbachov). Faroh: SchH 1 and dam of the vom Blitzkrieger “I, K” litters (Icaro, Kali). Lazer: SchH 3 and sire of the vom Blitzkrieger “O”Litter (Orion).